I have known for about 50 years that Styrofoam is a disaster when it is out in nature, but it is still popular, and used widely both in the takeout food business and the boating and fishing industries. Two years ago I discovered thousands of Styrofoam pieces in the beach grass at South Beach, Edgartown. Five willets (shorebirds) had gathered on the shore while I was discovering hundreds and hundreds of bits of Styrofoam in the beach grass and on the shoreline. These beautiful willets are one of many species that will eat Styrofoam thinking it is food, and die from starvation. Where do these Styrofoam bits come from? Buoys, takeout cups and containers, coolers, meat and fish packaging, boats, boat floats, the shellfish aquaculture industry, surfboards, paddleboards, shipping blocks and peanuts, insulation, and florist foam are a few items that are Styrofoam. It may surprise you to know that most dock floats are made of Styrofoam, with a wooden frame. Inside that frame there is a very large piece of soft Styrofoam, similar to the Styrofoam of a picnic cooler, or sometimes more like blueboard that is used for insulation. Either way, the Styrofoam is exposed to the elements, wave action, any sort of punctures, and the constant wearing down that occurs to this nonbiodegradable plastic. Some designs have thousands of Styrofoam particles loose in a plastic covering that could be punctured, letting go all of those tiny pellets into the environment. Edgartown has 15 Styrofoam floats at the town landing on Edgartown Bay Road. They are out of the water now, and anyone interested can go and take a look at them. It looks like they are made of wood, until you get up close and look underneath or in between the the boards. What makes Styrofoam popular — that it is lightweight, buoyant, and inexpensive — is the same thing that makes Styrofoam dangerous to wildlife, humans, and to our environment. It blows away in the wind, it floats on the water, it breaks apart easily. It is inexpensive, so many businesses and municipalities choose it, but at what cost to our natural environment? Styrofoam is plastic, it is not biodegradable, it will be on our planet forever. It can only break down further into irretrievable plastic bits, called microplastics. These microplastics are already showing up in our food supplies, especially fish, and water supplies internationally. They are a danger to human health and the health of wildlife. Say no to Styrofoam takeout containers, coffee cups, coolers, etc. See what your town is using for floating docks, buoys, and aquaculture. We had a flourishing fishing community before the invention of Styrofoam. We had docks, floats, rafts, boats, etc., none of which were made of plastic. 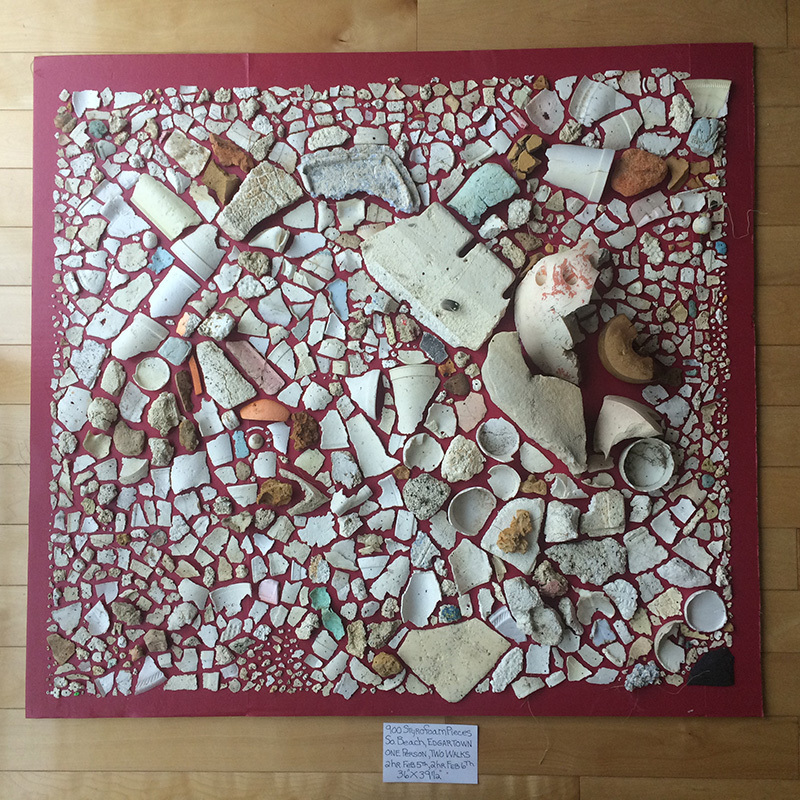 I have made a poster of 900 pieces of Styrofoam that I collected on Edgartown’s South Beach during two hours on Feb. 5 and two hours on Feb. 6, 2019. It is on display at the Edgartown library. Keep in mind, please, that this poster represents a tiny amount of the Styrofoam that is on South Beach. It does not include the Styrofoam on any of our other beautiful beaches, or the Styrofoam that is buried in the sand, or woods.